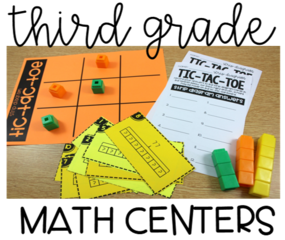 In this blog post we will uncover best practices for the teacher table or small group time during guided math! 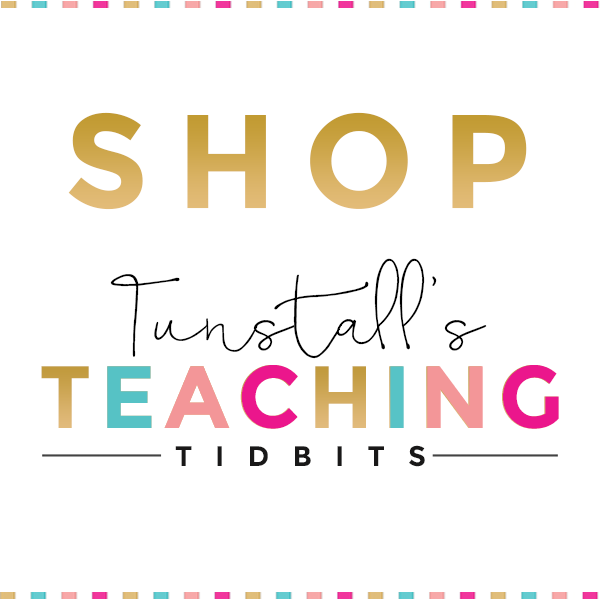 You’ll read what the research suggests as well as teacher to teacher tips on what makes the biggest impact during those precious minutes at the teacher table! 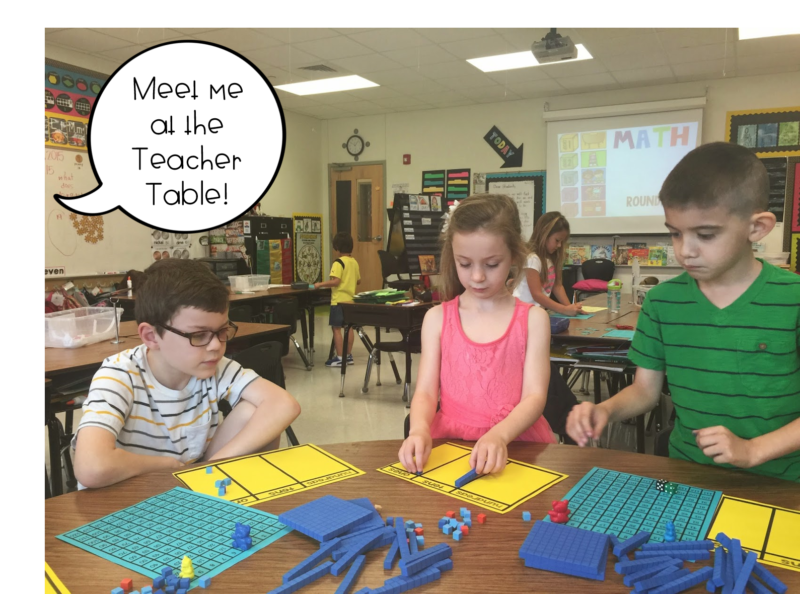 Meet me at the teacher table! 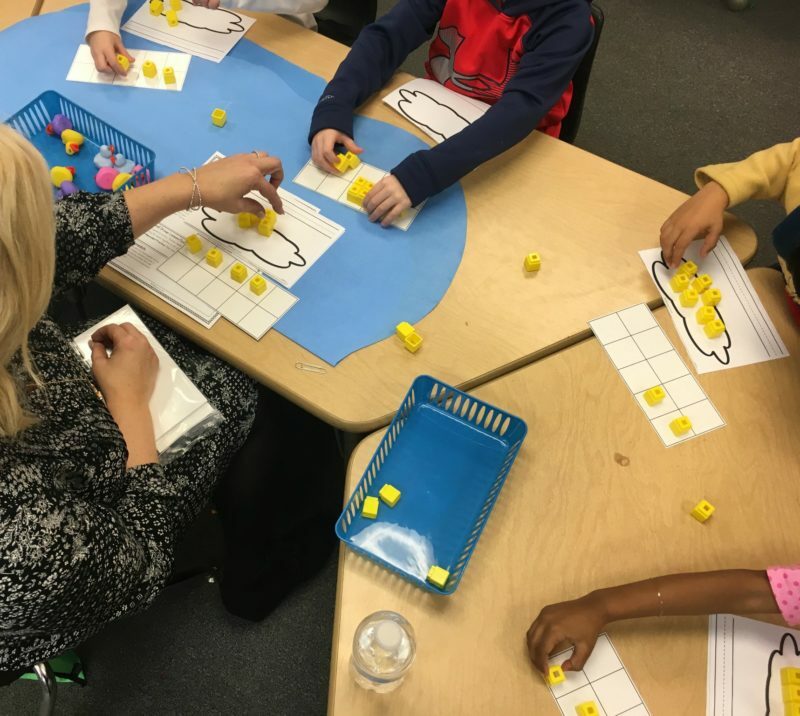 When you begin your planning for guided math small groups, it is essential to think about active learning at the same time. 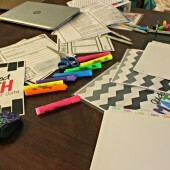 What will my students be doing at the small group table? 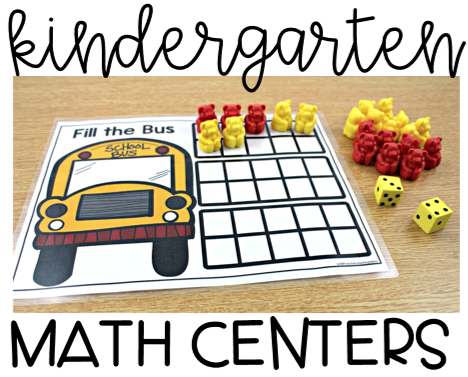 Flip the responsibility of doing the math from teacher to student. 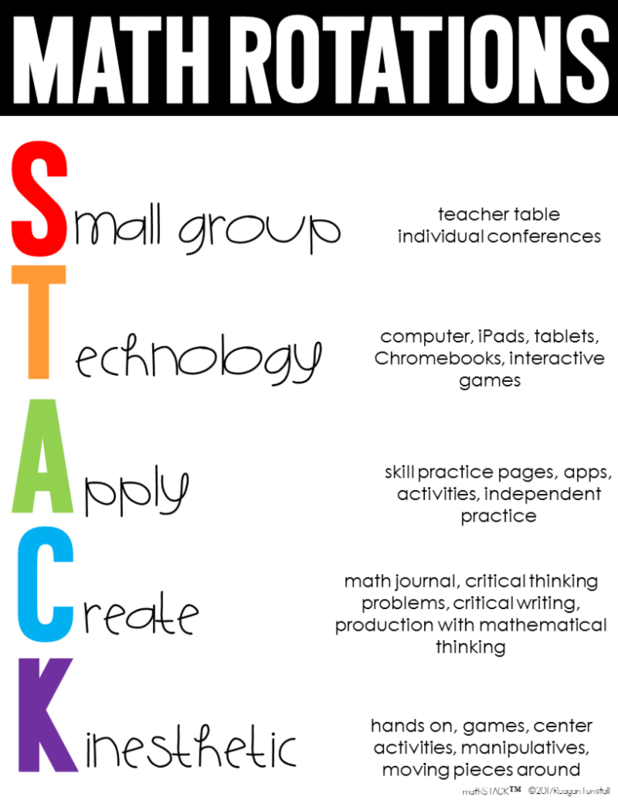 Take a look at your standard and look for active learning potential. To do this, pay attention to the verbs in the standard. 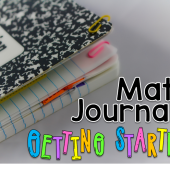 Rather than the old days of the teacher standing in the front of the class “doing the math” and having students record the answers in their workbooks, students now learn by doing. 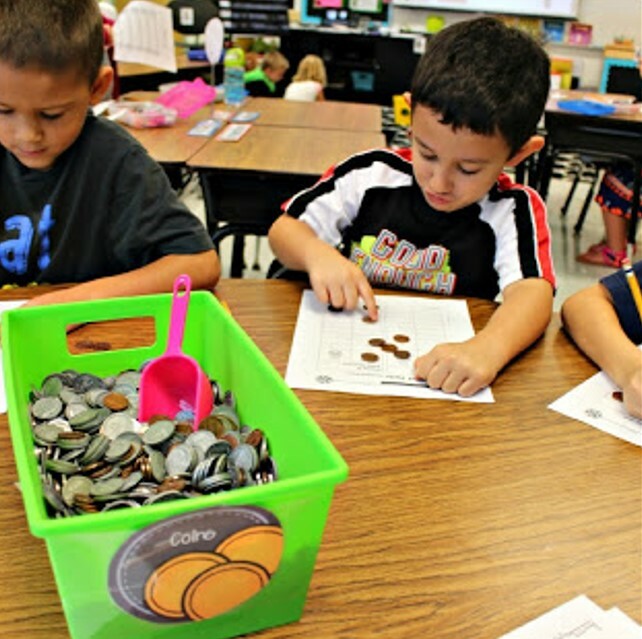 Every student is an active participant and responsible for the learning. 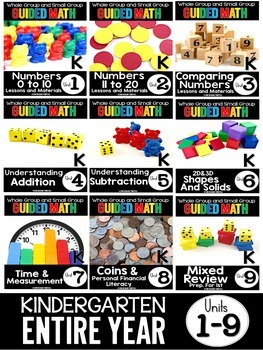 Look at the learning standard for your lesson. What are the verbs? Use that to guide what students will be doing in the lesson. Is it create? Build? Understand? Explain? Whatever your verb, that is your guide to making it active. Next, layer it with the level of depth and complexity that matches each group’s learning needs. 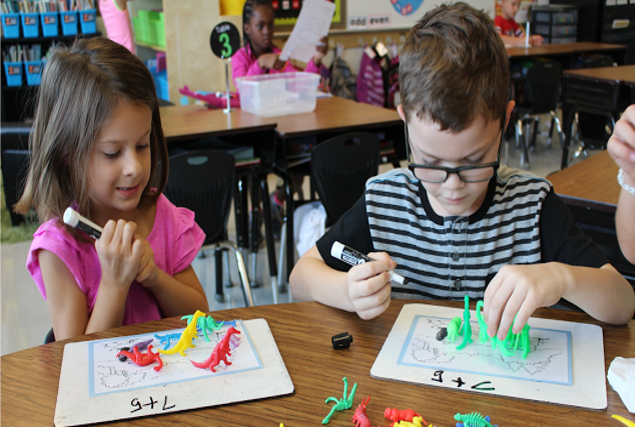 In the lesson below, students take turns telling addition stories which their peers then acted out with dinosaurs before writing the math equation and answer. 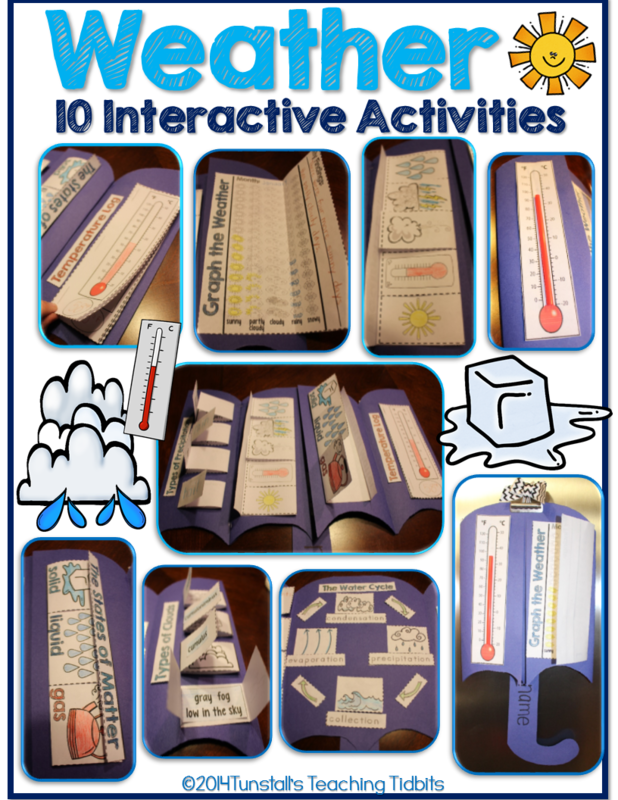 This activity based approach is about learning by doing. 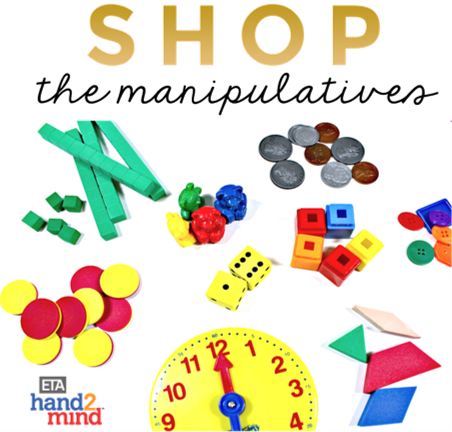 Students engage in activities to explore and learn mathematical concepts and skills. 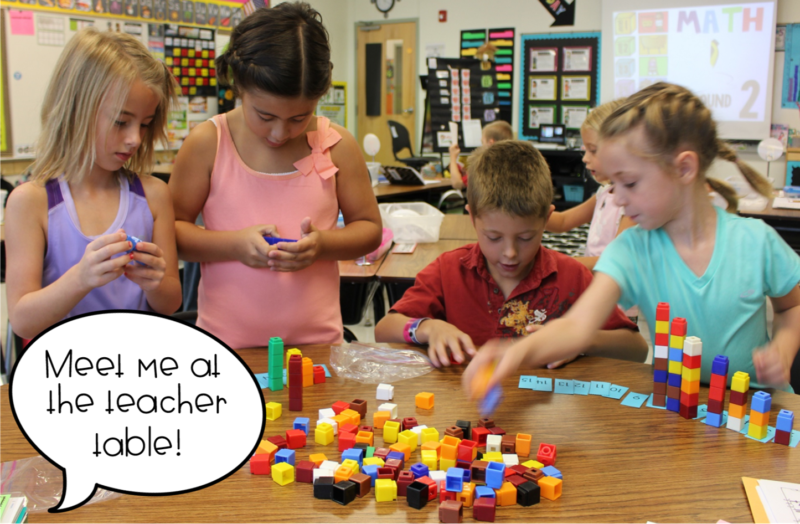 Using manipulatives or other resources students construct meaning and understanding. 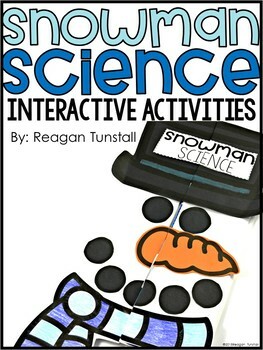 During the activity, students communicate and share their understanding using concrete and pictorial representations. The role of the teacher is that of a facilitator who guides students through the concrete, pictorial, and abstract levels of understanding by providing appropriate feedback. We all need extensive practice to gain mastery in just about anything. 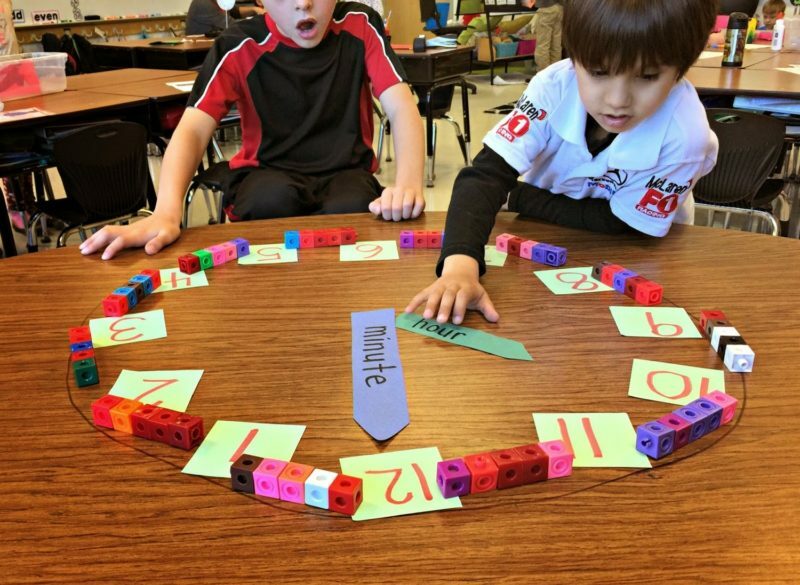 When students have consistent time learning new math concepts through concrete objects, pictorial representations, and abstract math, they progress through stages of learning with the greatest potential for soaking up the understanding. While it is important for students to ultimately work soley from the abstract, this is not the superior mode across all mathematical situations. 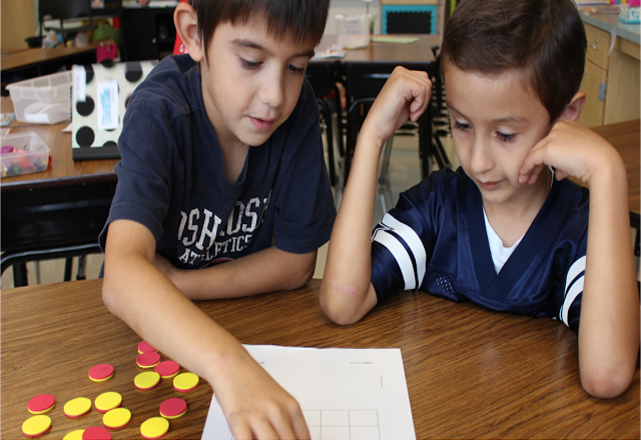 When students attack a new problem, if they are unable to switch to different modes of understanding, this limits their problem-solving abilities. 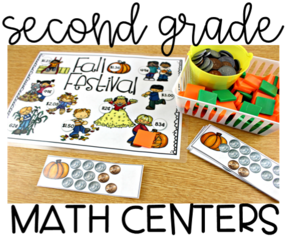 Familiarity with other modes allows students to “fall back” on a different understanding in order to solve the problem. There is no way for a student to “fall back” if there is no history of meaningful learning in other modes of understanding. We’ve all had the conversation at recess or lunch with the exasperated teacher friend that is frustrated that her students don’t “get it”. What seems so clear to the teacher may not be clear at all to students. 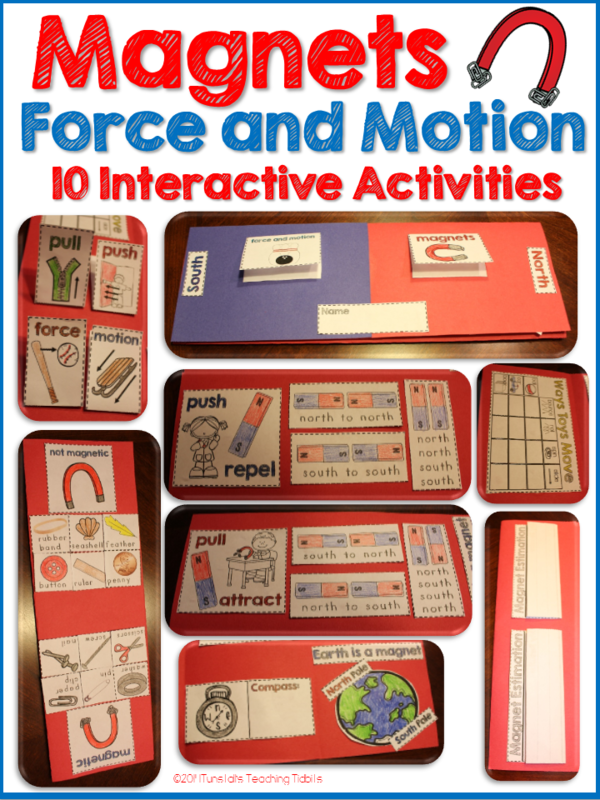 This is likely due to the level and modes of the students’ understanding. 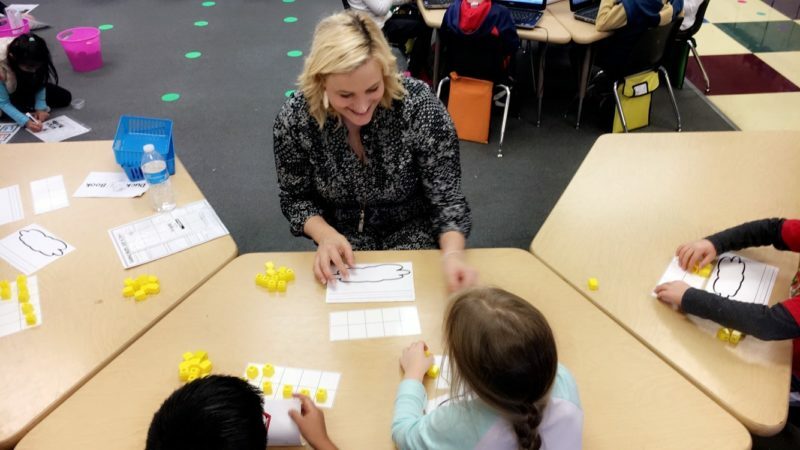 The more we can expose students to concrete and pictorial understanding, the more we nuture their ability to make connections in order to problem solve. 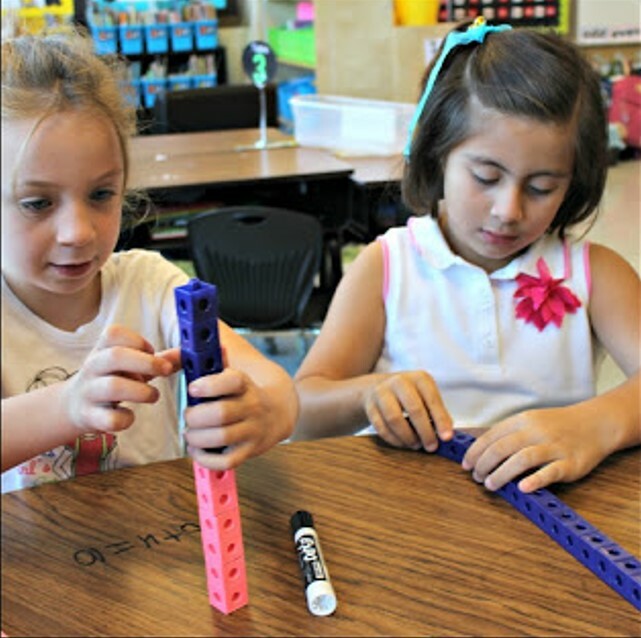 As students develop their understanding of what mathematics is and what it is useful for, they are more likely to insert themselves in the role of the mathematician. They can see themselves being part of a mathematical community. In order to completely understand the language we know, we have to use it, and hear other people using the same language. So from a practical perspective, students need to talk in order to develop their use of language (mathematical or otherwise). Rather than teacher talking and students giving a one word response, students need to have parallel discussions with peers. 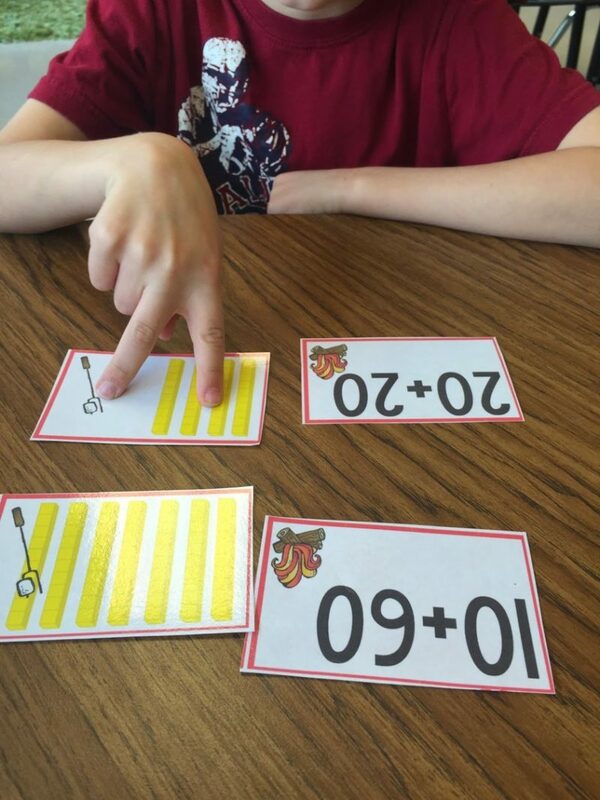 Below students are not just making math card matches, but must then explain why this is a match in their own words. We remember what we think about. 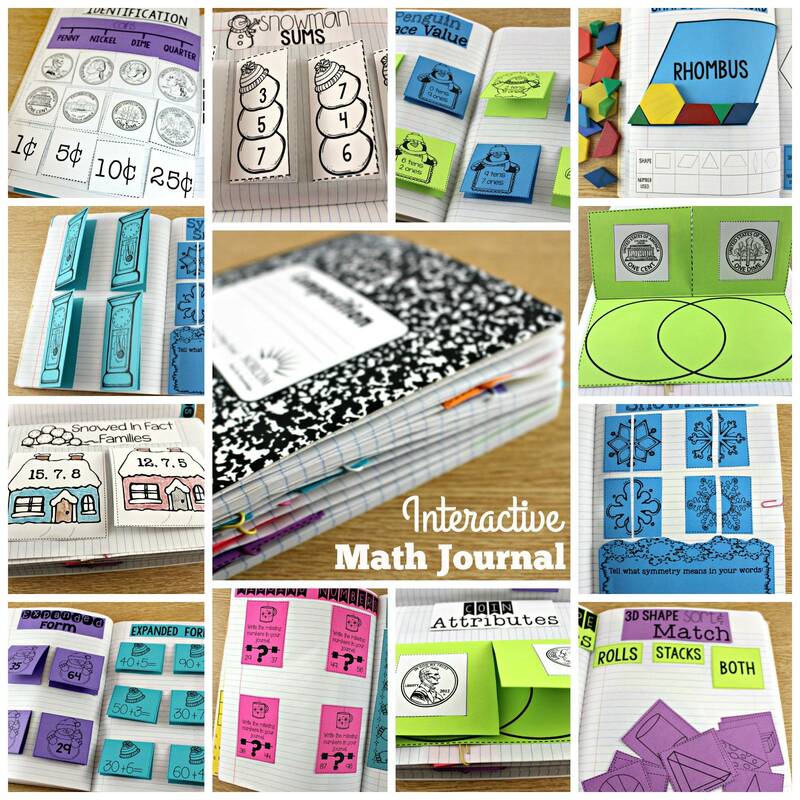 When students construct ideas and communicate them to each other, they have to purposely think about these ideas, which means that they are building memories. 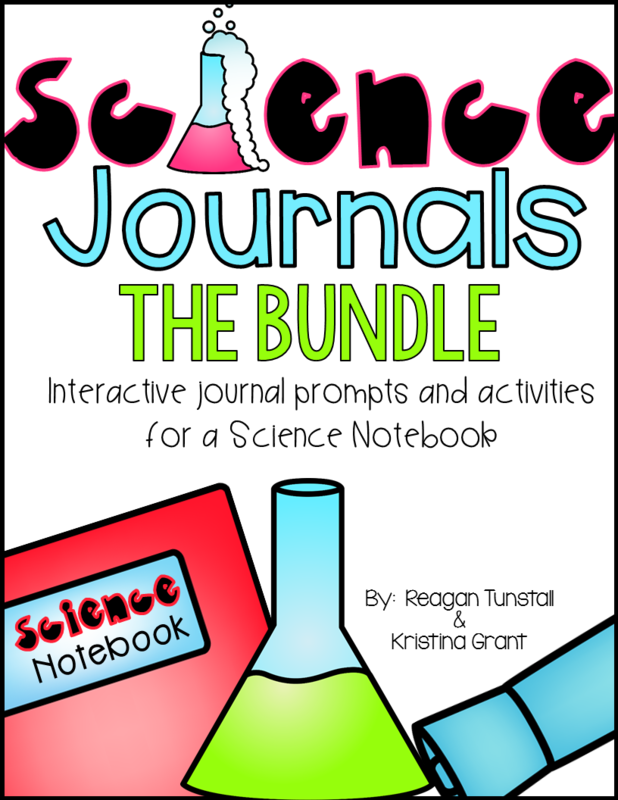 Finally, students talking to each other also provides their teachers with more information about the ways they are thinking which makes it easier for teacher to plan activities that respond to the ways students are actually thinking. 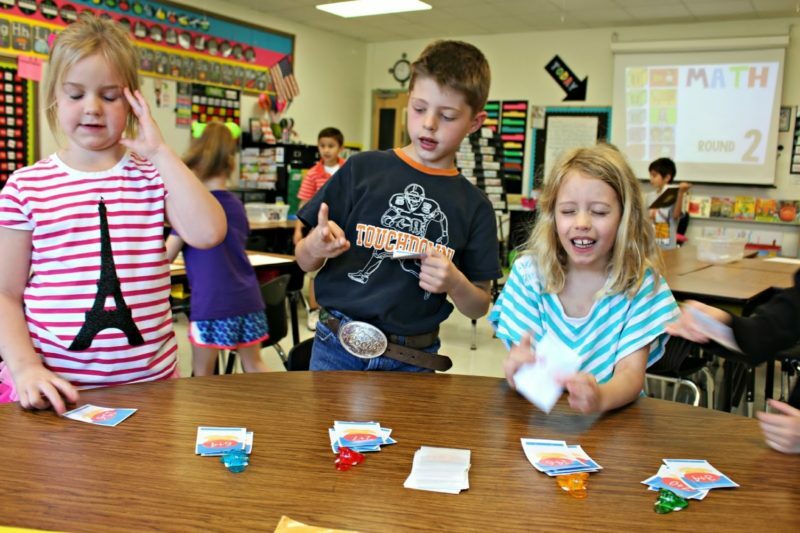 When students talk to each other, their teacher can gather formative assessment information about not only what they understand but how they understand it. 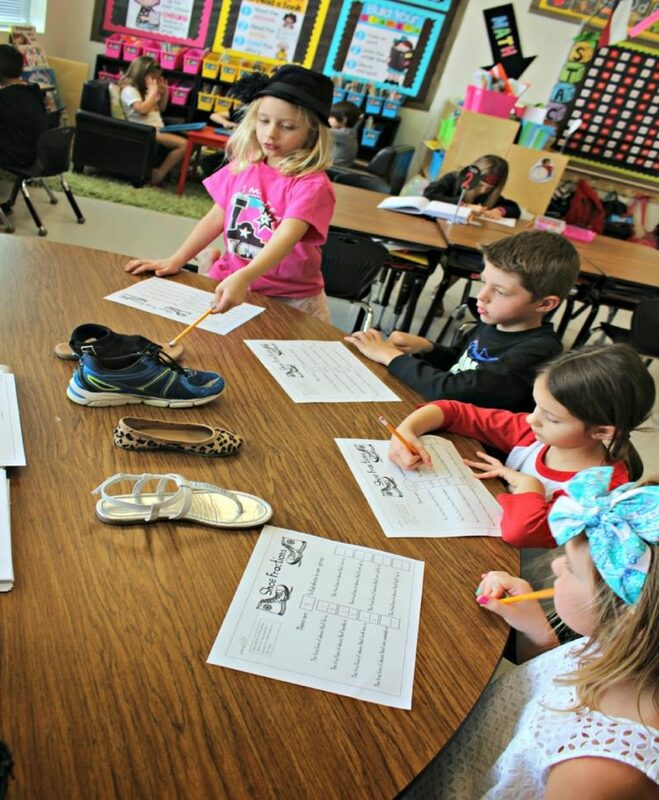 In the picture below students are discussing shoe fractions and justifying and agreeing on their findings. Each child has contributed one shoe to the table. 2 out of 4 shoes are sandals. This picture below encompasses so much about why we meet with our students in a small group! Teacher can clearly see how students attack a problem. Which strategies are being used? How comfortable are students? How accurate are their strategies? Is there another way? Was a connection made? All of this mathematical goodness is happening in front of us daily. These students are working in the abstract in a timed situation which brings their mental strategies to the forefront. Nothing motivates me more than a full teacher bag of prepped materials for my classroom. Nothing…ahem…. Okay, okay, maybe Taco Tuesday but other than that…NOTHING. 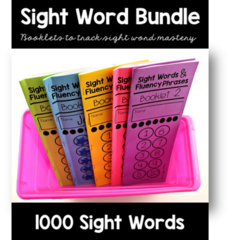 Knowing students’ needs and having materials ready to teach, is the pathway to a successful day of teaching. 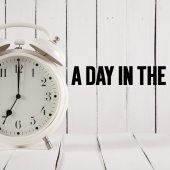 The day flies by because we are so excited to engage students in new understanding during our day! But then, the days keep coming one after another, there’s meetings, parents, and oh yeah…our own families and all of their needs. It’s a lot. Sometimes manageable and other times not. We feel like we are drowning so compromise slips in and we find ourselves scrambing to have quality materials for our students. I.have.been.there. Not for a day, not even for just a week. I have lived in that space. It’s frustrating. Out of that frustration grew a list. 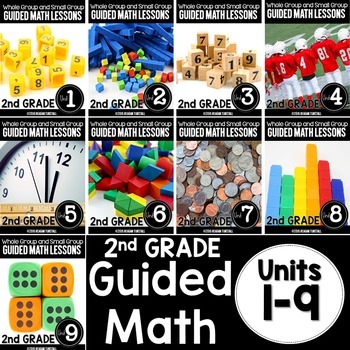 That list grew into a guided math series that I wrote containing whole group and small group lessons. Not just the lessons, but the materials I needed for that lesson. 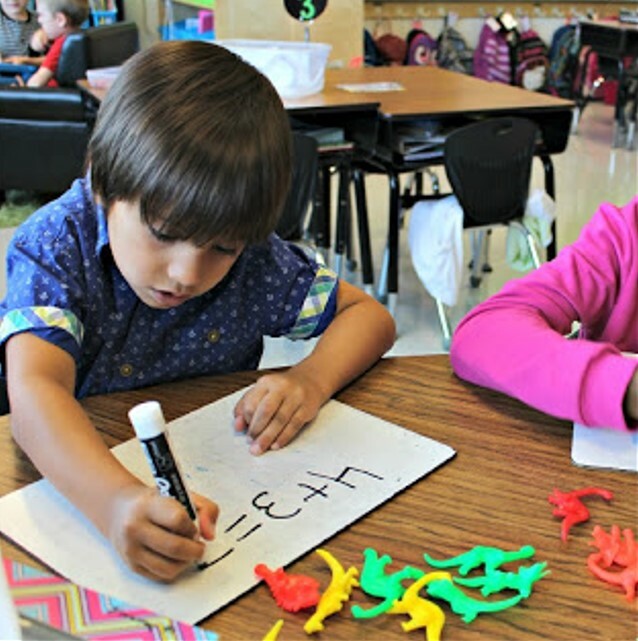 Ducks in a Pond -Introductory lesson with kindergarten for addition to ten. Let’s talk about prep. 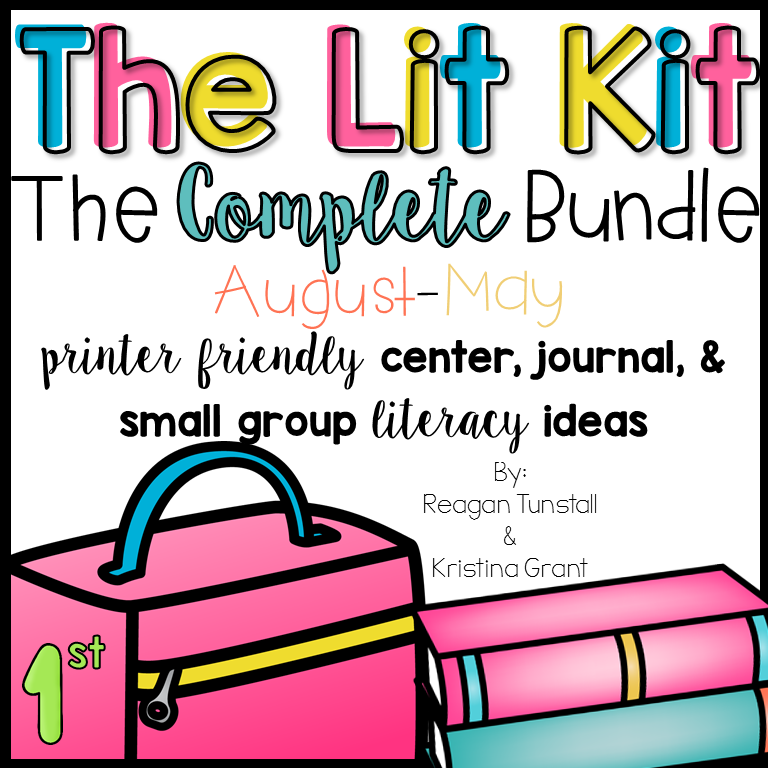 Small group requires materials. Materials require prep. Prep takes time. 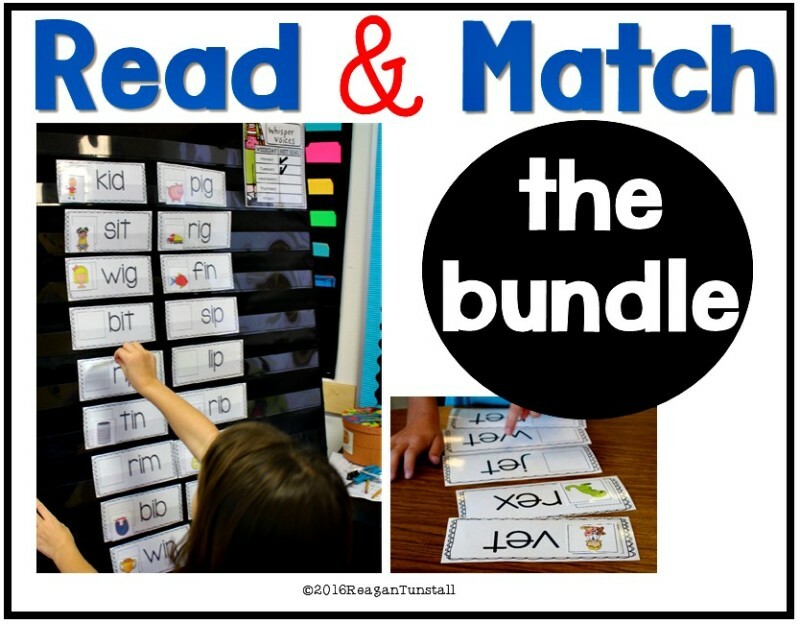 The way I have always looked at this issue is that investing my time in prepping materials that make my life easier in the long run is worth the time investment. The first year of prep is an uphill climb with laminators running hot with overuse. Year two is euphoric with beautifully prepped materials awaiting use. Sometimes I just sit and stare at them with happiness. 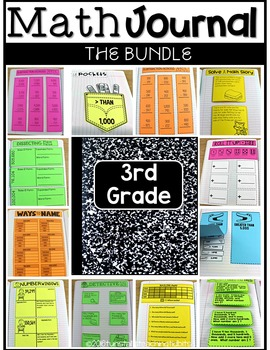 The area that you are able to save time is in your future lesson planning. It’s done! It’s written, prepped, and ready! The investment of time upfront pays in spades. 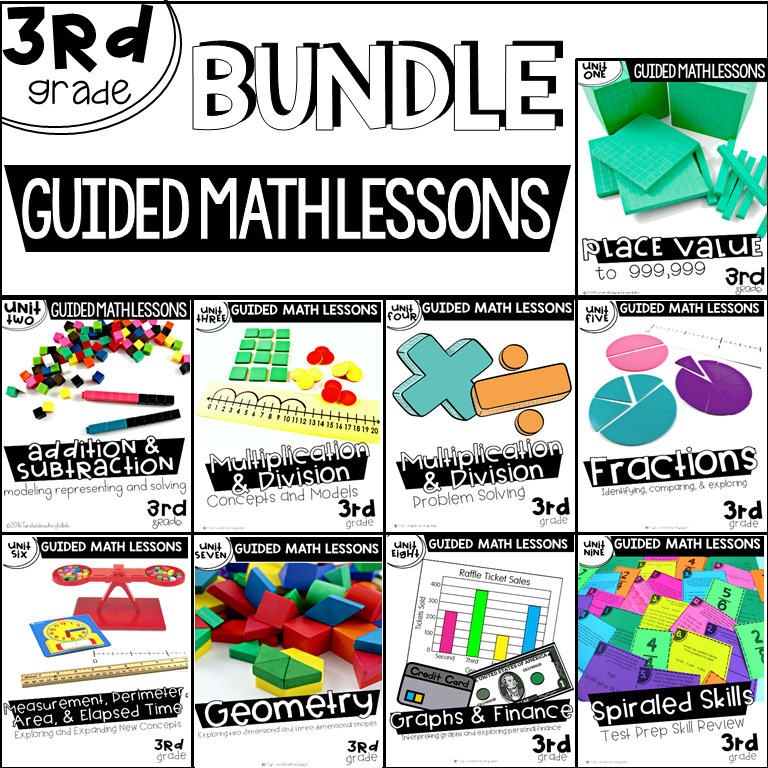 I have guided math materials for K-3 grade. 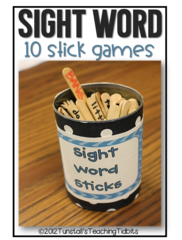 You can check them out in my TpT store. 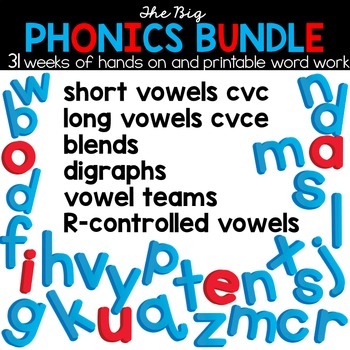 These links will send you to the category page for your grade level. 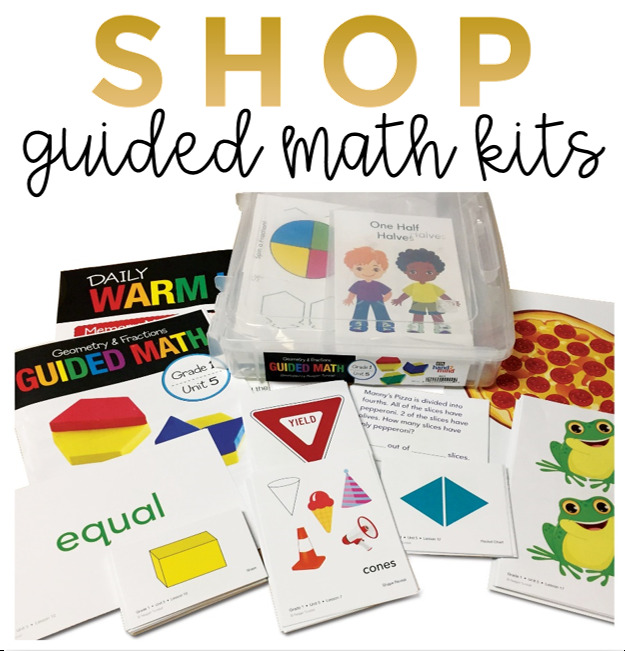 You will need to scroll just a little past the top of my store to find the guided math materials. There’s a new timer in the STACK family! 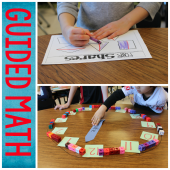 I have shared the management aspect of having guided math groups on the blog before. 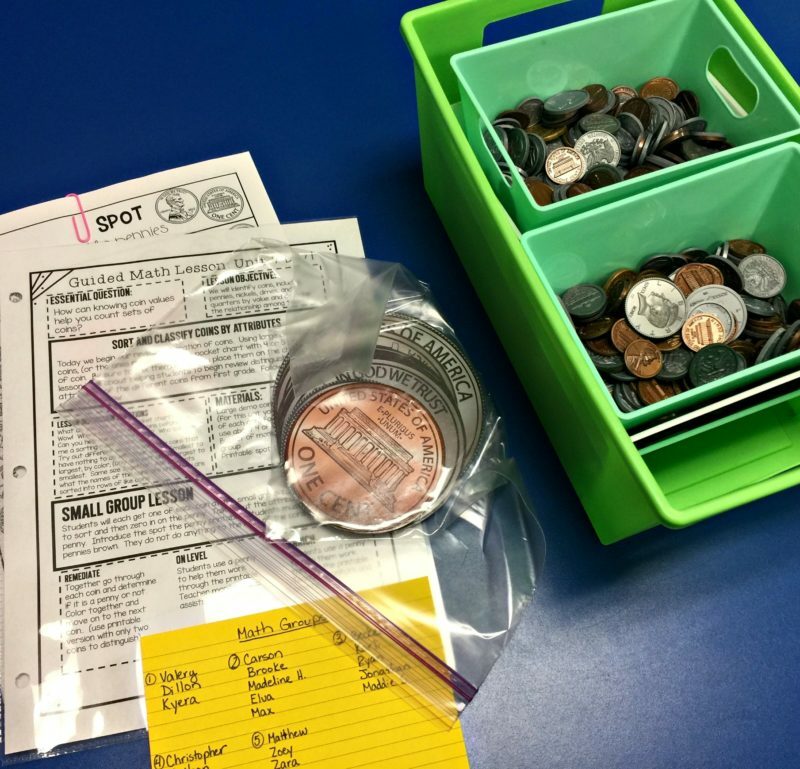 Using a management system is crucial in keeping students organized, on task, and accountable. As I have spent time with different schools the last two years, I have worked with so many different teachers to find a rotation plan that meets their needs. Each class is unique. The amount of time a teacher needs with her groups is different for a few reasons. 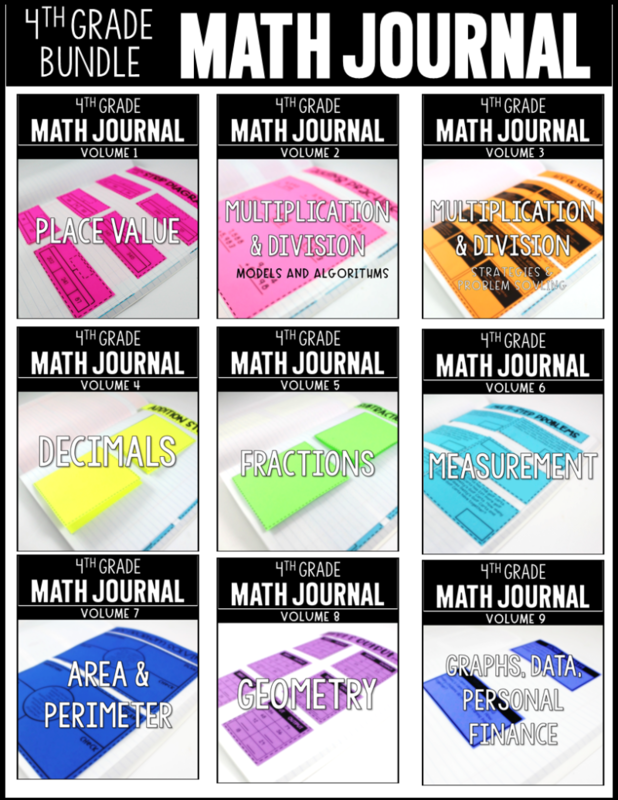 Number of students, length of math block, resources available for students. One fact remains the same, the management system makes the rotations run smoothly! 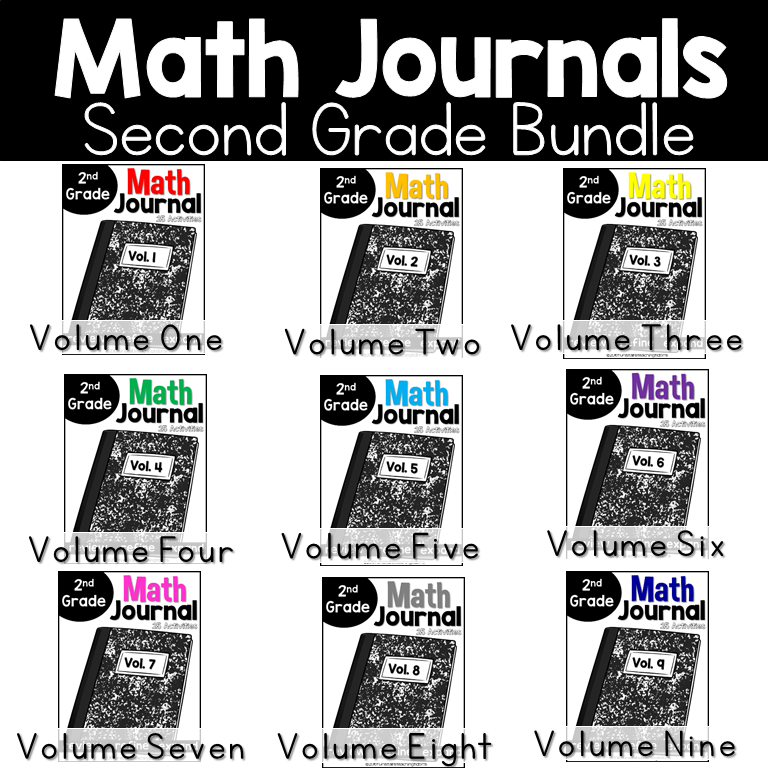 To address this need, I wanted an updated managementsystem that would address all the different times and choices that teachers love with their guided math groups. 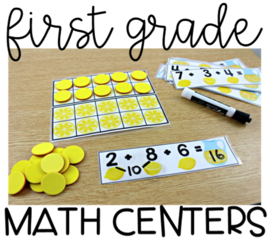 This is a powerpoint that you project on your whiteboard or smartboard when it is time to get into guided math stations. You do not need to know technology to use this! Everything is programed and ready for you to hit play! The timers countdown. Then they ring a bell while the timer flashes “Time’s up!” The next rotation begins and the time automatically counts down again! There is a clean-up slide set to one minute at the very end. 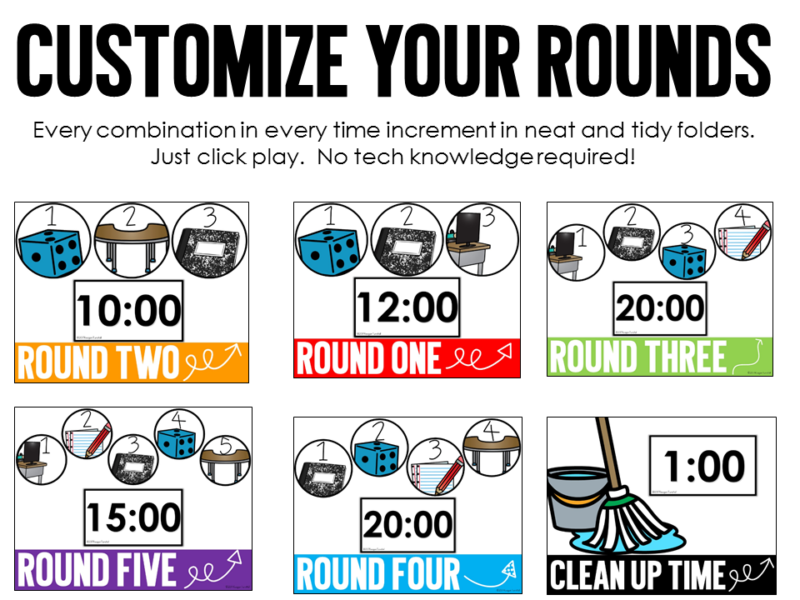 You just need to decide the time, number of rounds, and choices for rotations. 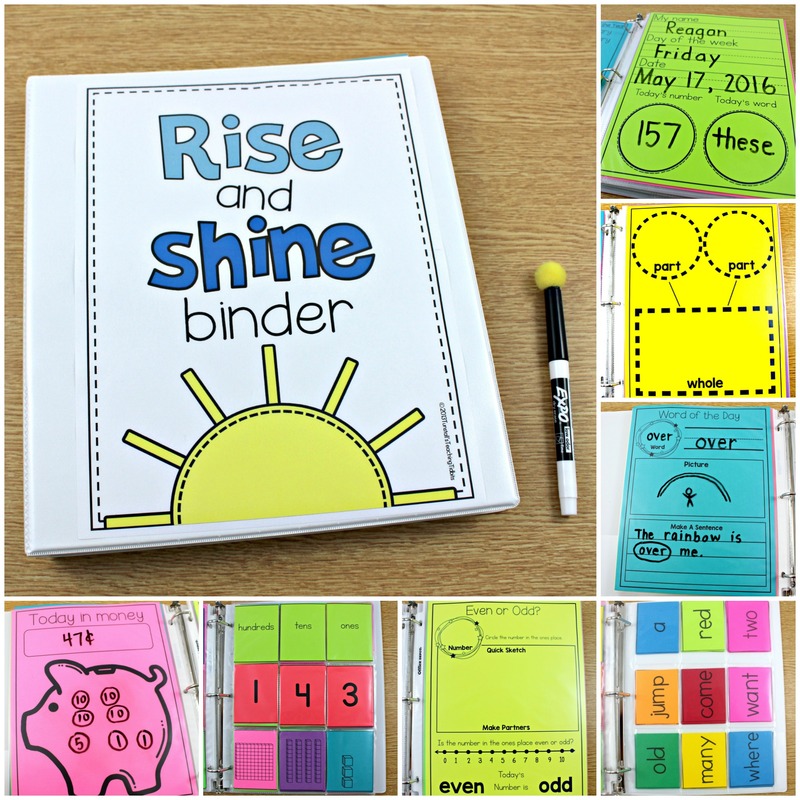 Every combination of choices has been created and put into folders for you! 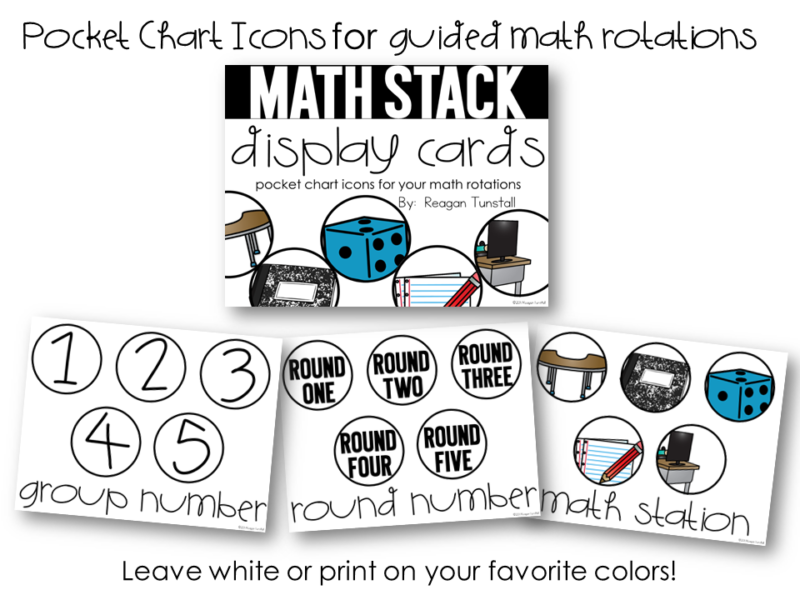 If you enjoy a wall or pocket chart rotation system and are ready to switch things up, these icons are set to go! 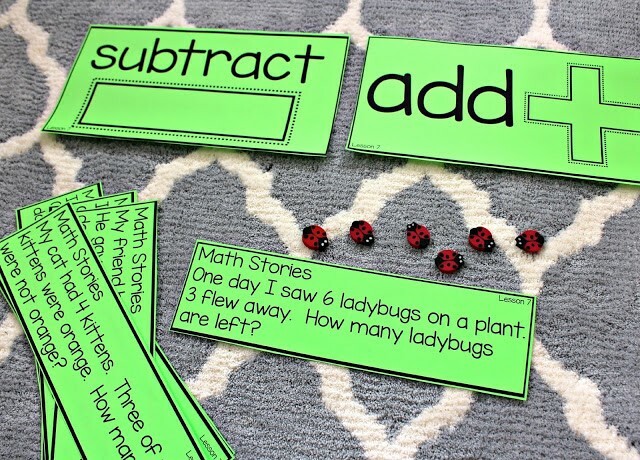 I also love to use them to label materials for those stations in the classroom. If you like the clean white version, just print as is! 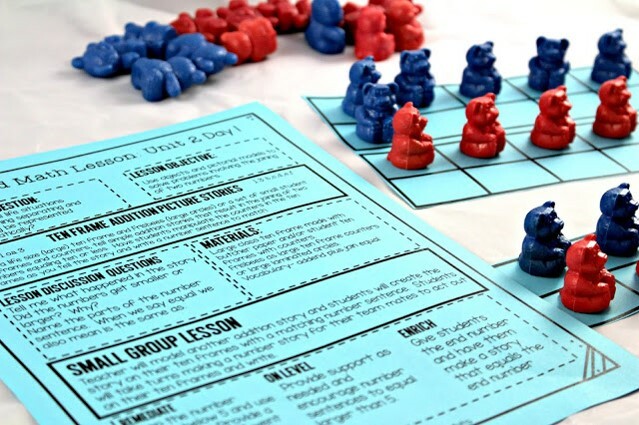 If you want it to match your classroom color scheme, choose your favorite colored paper for the group and rounds! 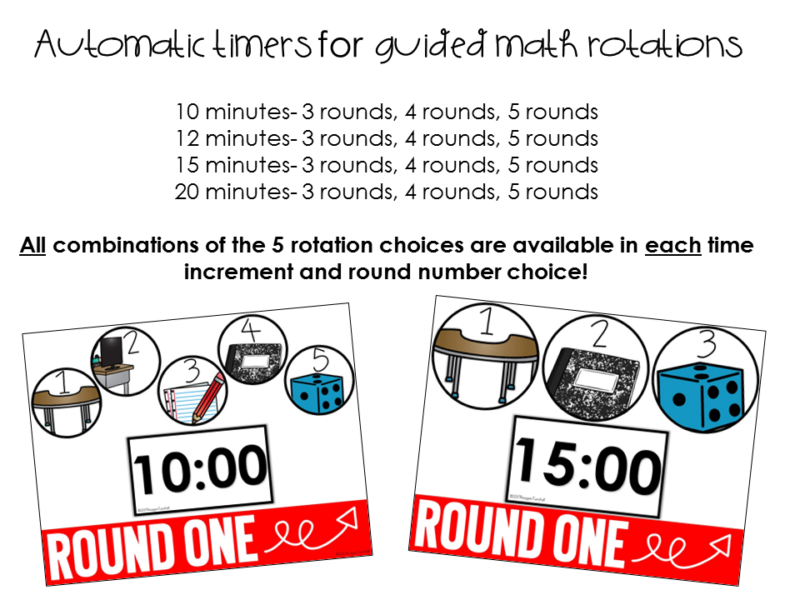 If you are unsure on which rotation choices you would use or want, I have a graphic to help! Choosing from different learning modalites in your rotations creates a more well-rounded mathematician. Plus there’s the added bonus of some of these choices being very calm and quiet. Leave a comment or question if you have further thoughts on small group that I wasn’t able to touch on in this post! I would love to hear from you! Thank you! 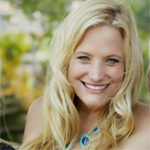 I’ve loved having your blog as a great resource! Math rotations are my students’ favorite time of day! Mine too! Awesome rotation methods. Very well planned. Hello! 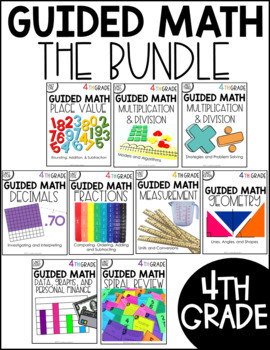 I was just wondering when you utilize the guided math groups? Is this something you do daily or weekly? 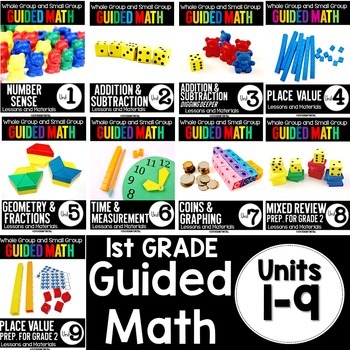 I have been thinking about doing guided math groups, all of your information has been super helpful! Hello! 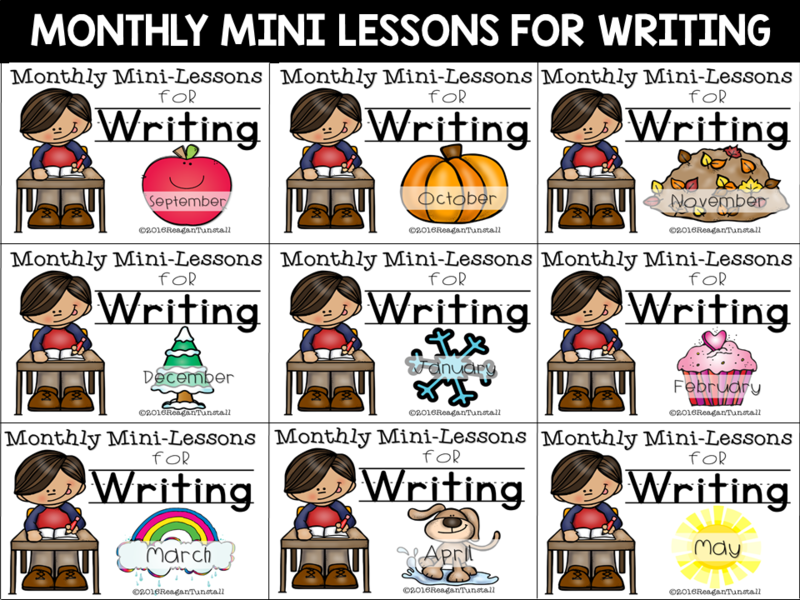 We do stations/small group everyday after our mini lesson. 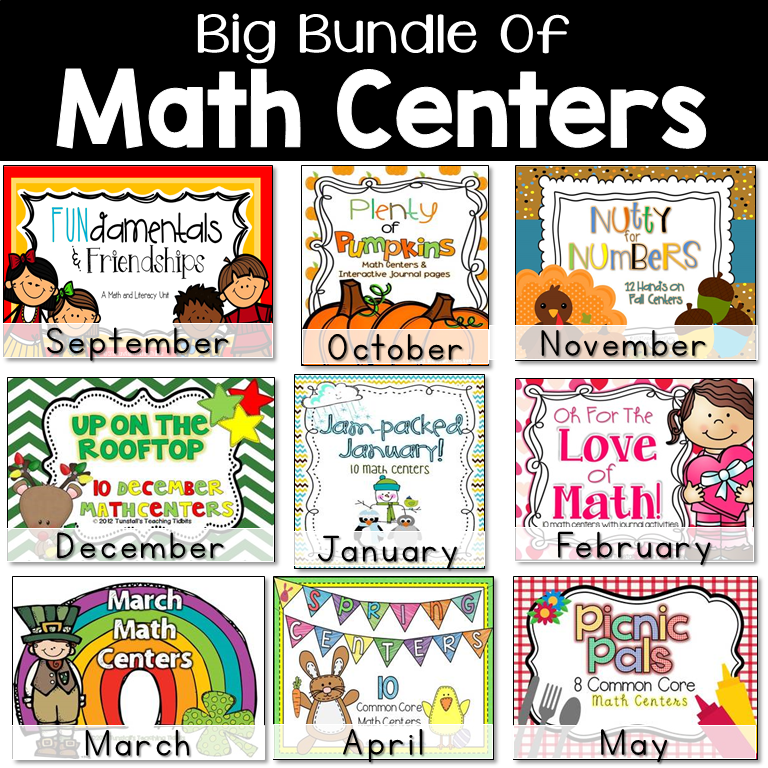 I have a little guided math series on the blog. 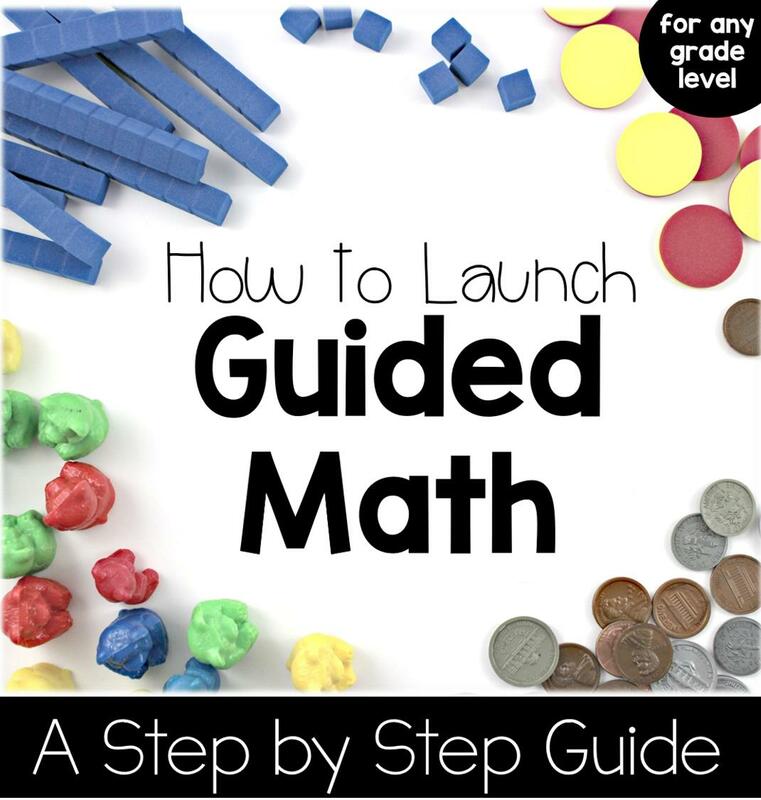 If you search guided math in the search, you will find how I break it down. 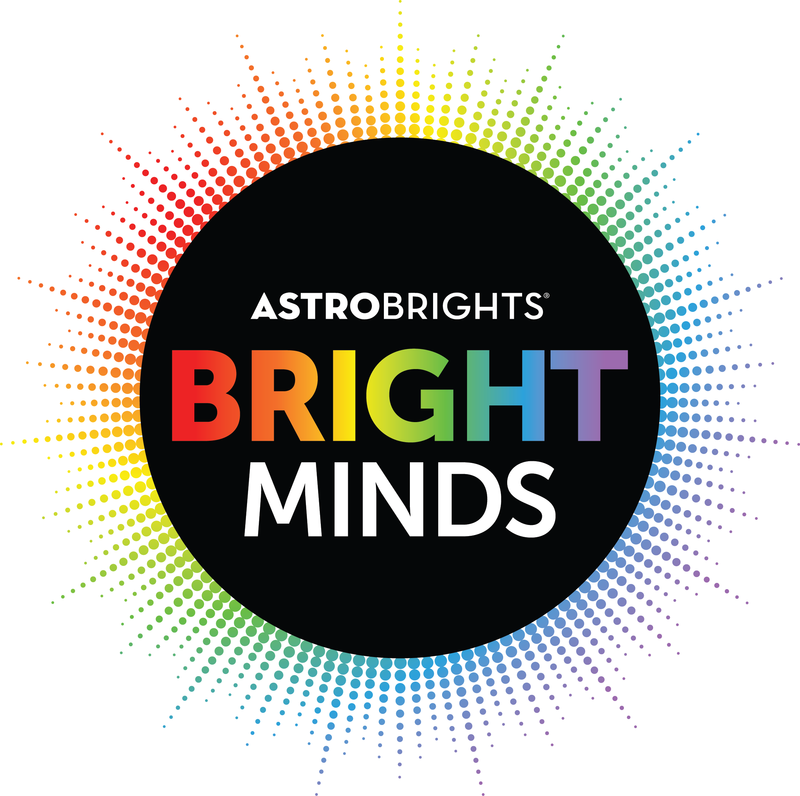 Have you considered coming to Miami to do a conference?